We’ll float down the Suwannee River to this spot Sunday afternoon: come join us! Picture from Hamilton County, by Marsanne Petty, on page 12; found by Chris Mericle. They don’t build them like this anymore. It’s hard to even find any left standing like this. Follow this link for details on the Sunday outing from FL 6 to Cone Bridge. 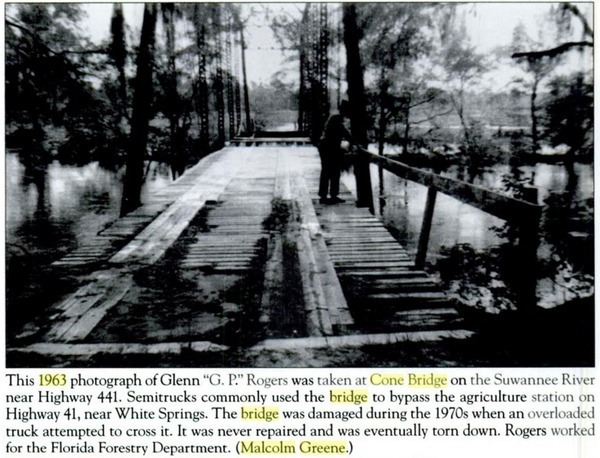 This entry was posted in History, Outing, River and tagged Chris Mericle, Cone Bridge, conservation, CR 6, Cypress Creek, Dennis Price, Florida Forestry Department, Glenn Rogers, Hamilton County, history, Marsanne Petty, north Florida, Outing, river, south Georgia, Suwannee River, watershed, WWALS, WWALS Watershed Coalition on November 19, 2015 by jsq.